Those who know me well enough know that I have been off of store-bought bread for a while now. But that means that I have to make my own bread else I have to go without bread for a few days. So after a long break and not having bread for a while now, I decided to bake some bread for myself today. 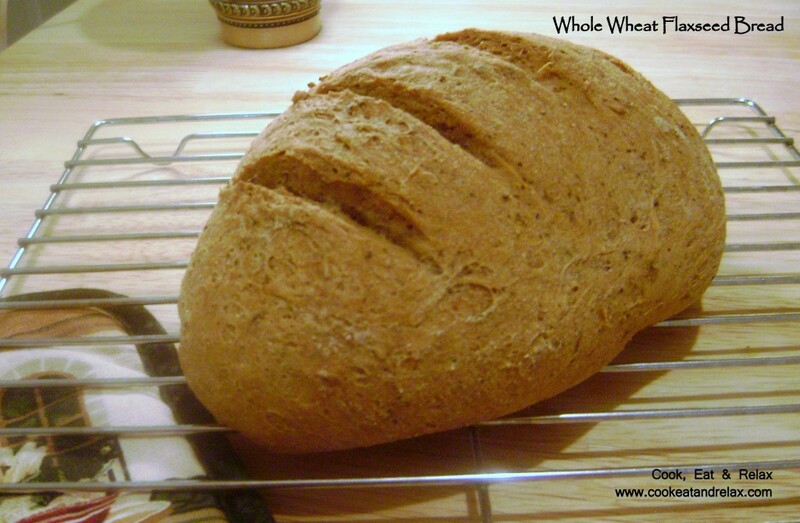 This is another treasure from the book Healthy Bread in Five Minutes a Day. It is just five minutes of work mixing the bread and another five minutes to shape it. And obviously it takes as long as it takes to bake the bread. And yes the flaxseed flavor is an acquired taste but it is extremely healthy and contains tons of omega-3 fatty acids, yeah the same stuff found in seafood. I am told that omega-3 fatty acids are a very healthy form of polyunsaturated fat. So all in all, this bread is extremely healthy, contains whole wheat, so there’s your fiber and then the flaxseed. And there is no oil or butter used! Now let me get to the ingredients. This makes about two 1-pound loaves. Now if you want all the detailed instructions that the authors of the book give, you will need to buy the book. It is a treasure trove of awesome instructions and little details that make your bread baking experience a really incredible one. Mix together all the ingredients in a large mixing bowl of lidded container. Do not knead the dough, just mix it well together and set it aside in the bowl. Let the dough rise for about 2 hours. Let the dough rise and collapse. Now you can either make the bread the same day after the initial rise but it tastes better if left in the refrigerator for atleast 24 hours. When you are ready to bake the bread, dust the dough with some flour and cut off a grapefruit sized dough. Quickly shape the dough into a ball by bringing together the ends of the dough together underneath the dough and turning it to shape it. Allow the dough to rise on a pizza peel prepared with cornmeal or lined with parchment paper. Cover the dough with a plastic wrap. Or you can use a greased cookie sheet or a silicone mat to let the dough rise. Next place a baking stone on the middle rack of the oven and pre-heat the oven to 450 F for about 30 minutes. Also place an empty metal broiler tray on the bottom shelf of the oven. Slash the top of the loaf with a serrated knife (parallel cuts) just before moving the dough into the oven. When you transfer the dough into the oven, pour 1 cup of hot water into the broiler tray and shut the oven dough. Now bake the bread in the oven for about 30-35 mins till the bread is nicely browned. Cool the bread in a cooling rack before slicing it. Hope you enjoy baking bread at home as much as I did. 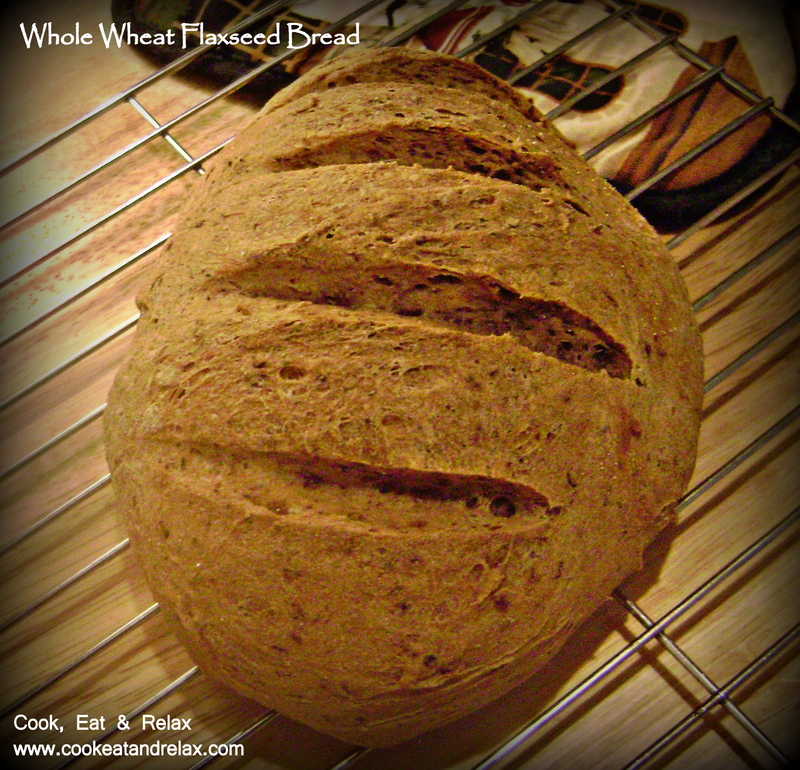 I promise, you will love this bread and this recipe is a keeper for sure. If you do try the bread, please do let me know whether you like it. Thank for reading my blog and happy baking! 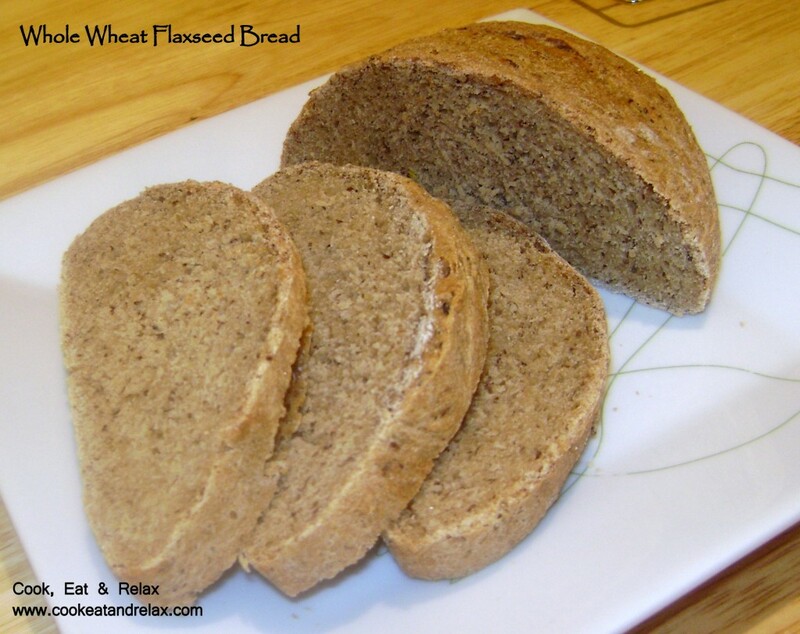 This entry was posted in Bread, Recipes and tagged bread, flaxseed, whole grain, whole wheat. Bookmark the permalink.